Politics is all the rage on social media. Literally. 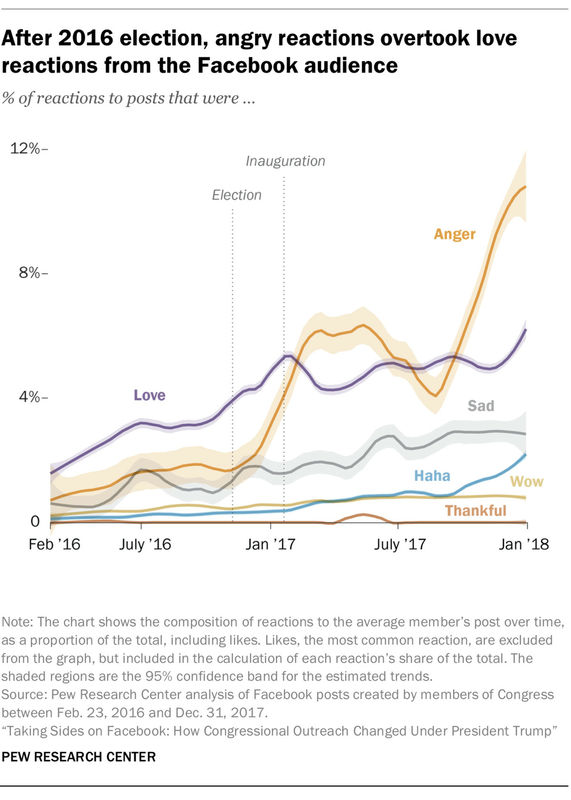 According to a new analysis by the Pew Research Center, people are increasingly responding to Facebook posts from members of Congress with “angry” reactions, instead of the previously more common “love” reactions, since the election and inauguration of President Donald Trump. “Like,” the default option on Facebook, is still the most common reaction. But Pew left it out of the chart to compare the less neutral reactions. One question here is what people’s angry reactions on Facebook are actually meant to convey. Someone could click “angry,” for example, if she disagrees with the Congress member’s opposition to Trump, or she could hit “angry” to show she shares the Congress member’s strong opposition to the president. Regardless, people are angrier — or at least more likely to express that anger on Facebook.